Like most kids I loved dinosaurs. I really loved dinosaurs though. I had every dinosaur book you could find. I had the entire collection of Aurora model dinosaurs, (although they ran the gamut from early reptiles to dinosaurs to mammoths and cavemen) and I still have them packed away in my back room. I had a deal with my parents that if I saved half the money for a model they would match the other half. I knew the price of every single one and whenever I had half the money for the next one I would pester and pester until we went to the store and I got it. One time when I was around six, I saw a set of little plastic dinosaurs and prehistoric animals I wanted. I remember it came in a box like a little cardboard suitcase, complete with handle to carry it around. The day came when my mother took me to the store to get it. I don’t remember the name of the store, but everything was on display or in a catalog and you wrote the number of the item on a slip of paper and handed it in. You then went to the back of the store and waited by a counter. Behind the counter was a conveyor belt where the stuff you ordered eventually came through a curtain of plastic strips from the warehouse. It was like waiting for your luggage at the airport. It finally came out and when I got home I opened it and discovered that it contained two Dimetrodons and no Saber Tooth Tiger (Smilodon, know-nothing toy company!). I was inconsolable. My mother told me in no uncertain terms that we were not going back to exchange it, temper tantrum or not. I think that might be the moment my innocence died and my cynicism took hold, not to mention my OCD. Speaking of OCD, I was intent on the correct pronunciation of each dinosaur. I would keep a list of any dinosaurs that I wasn’t sure of the names for the next time I had to go to the doctor. Once my mother had pointed out that doctors knew Latin and could tell me the proper way to say the dinosaur’s names she never had to drag me there again. I had to wait until the end of my checkup to ask him to read off the names and I would say them over and over in my head so I would always remember. The trickiest one was a pterosaur named Rhamphorhynchus. I still have a database in my head of hundreds of dinosaur and prehistoric animal genus and species names. If I ever get on a quiz show and the category “dinosaur names” comes up, watch out! Otherwise it is basically useless knowledge if you’re not a paleontologist. 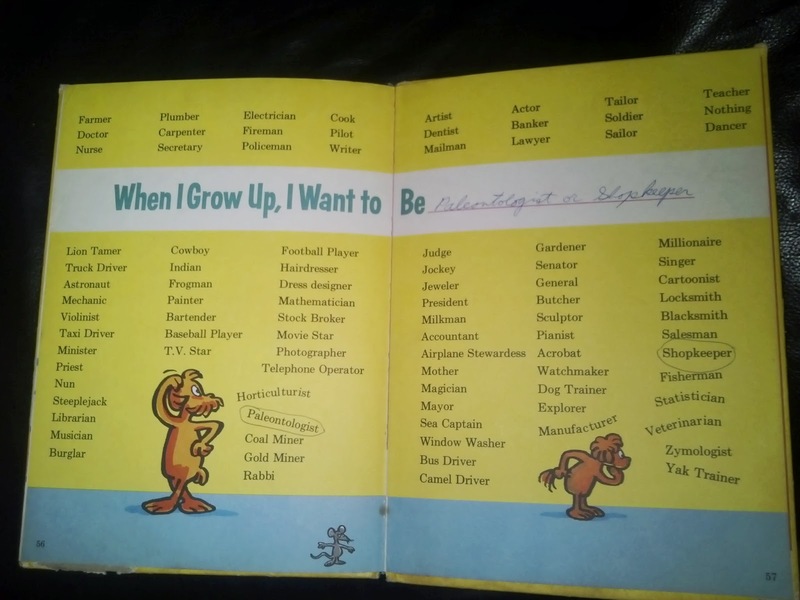 Speaking of which, when I was about eight I got a Dr. Seuss book called “My Book About Me”, which a child fills in all the information about themselves. 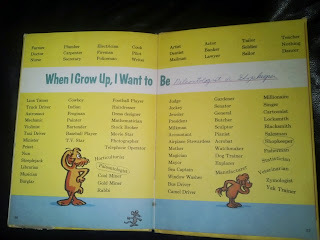 On the page where you have to fill in what you want to be when you grow up I wrote “paleontologist or shopkeeper”. Two very dissimilar fields, I know, especially when you consider that by shopkeeper I meant grocery check out person at the local Grand Union! For some reason, if I couldn’t be out in the field discovering some new dinosaur species or unraveling the mystery of ancient life I would be just as satisfied punching numbers in a cash register at a supermarket. When my family moved to Texas in the mid seventies I was thrilled to find out that there was a manmade lake in town and you could find fossils in the banks when the water level was low. Could you ever! My father would take me down there and I would pluck all kinds of ancient marine life right out of the dirt. There were all kinds of ammonites, ancient mollusks, blastoids, cephalopods, so many amazing fossils there for the taking. No one around there really thought anything of it, they were that common. Then there were the dinosaurs. My family took a ride to Glen Rose, to Texas to Dinosaur Valley State Park, and there in the Paluxy River were dinosaur footprints! You could walk right into the river when it was low enough and put your foot right into the footprint of a dinosaur. There were tracks from a Pleurocoelus, a sauropod dinosaur like Brontosaurus (which is in actuality called an Apatosaurus). Well, kind of. Pleurocoelus was named the Texas state dinosaur, but then it was found that it might just be the same as the Maryland state dinosaur called Astrodon, meaning there was no such thing as a Pleurocoelus. Then some of the prints and bones were found to come from a new species named Paluxysaurus, after the river they were found in. So they changed the state dinosaur to Paluxysaurus, which might have been pointless because now it is believed that Paluxysaurus is just a Sauroposeidon, meaning it doesn’t exist either. Dinosaurs are very confusing. I probably know more names that aren’t dinosaurs any more than names that actually are at this point! My father worked on a construction site in Glen Rose, building a nuclear power plant and they would come across fossils all the time. Whenever they did the job would shut down while scientists would study or remove the fossil, or at least decide if it was important enough to try to preserve. Of course the workers hated when it happened because it meant no work and no pay until the fossil was removed. My father told me about one day when they blew up some rock and there was a huge almost complete pterosaur skeleton in the cliff face. The foreman discussed it for a bit and decided to just blow it up so the job could continue. My father was sick about it, as was I when he told me. One night my mother and father took me for a ride, and we ended up at the jobsite. My father took us to a building full of equipment, and in the back of the building he pulled a tarp off of a three foot square cube of rock. They had found a perfect footprint from a therapod dinosaur which they all said was Tyrannosaurus, but was actually an Acrocanthosaurus,(amateurs!) the other dinosaur that left tracks in the Paluxy River. It had amazing detail; you could see the point of each claw, and the skin pattern left in the mud that was now solid rock. They kept it a secret and the plan was to put it in a glass case in the entranceway of the main building when it was finished. I’m not sure if that ever came to pass as it was immoral if not illegal to keep a museum grade fossil found onsite and not report it to the authorities. If you’re ever at the plant, look for it in the lobby and let me know. I’d love to see it again. We left Texas and moved to Pennsylvania in the late seventies. We bought a house in Coopersburg right at the time that a dinosaur trackbed was discovered in town. It was kind of a big deal, not just to me but to everyone. The first day at the house I jumped on my bike and rode up there. Jim Turner was the geologist that first found the tracks, and he was on site that day. He was impressed with the ridiculous amount of dinosaur knowledge a fourteen year old possessed and he let me work on the site cleaning footprints along with the scientists or grad students, or whoever they were. People were showing up constantly to gawk, so he had me giving tours and explaining the prints and the types of dinosaurs that made them to the crowds. As you could imagine I was in my glory! For the record, the tracks dated from the late Triassic period, around 220 million years ago. They were earlier dinosaurs, not like the huge ones people are more familiar with. The ones that stand out in my memory are Coelophysis and Grallator, both fairly small bipedal meat eaters and Phytosaurus, a crocodile-like reptile. One day as I was leaving the site I found a rock outside the fence near the highway that had a fern fossil imprinted in it. I carried it back to Jim and he took it and that was the last I heard about it. Very soon after that interest waned and for whatever reason the site was closed. I was bummed out about not being able to be a junior paleontologist anymore, but life went on. A month later, I was reading the new issue of a science magazine called Omni. There was a section every month called “continuum” which focused on new science blurbs and stories. There was a picture of my fern fossil with a little written piece about how it was found in Coopersburg and it was previously unknown in that area and strata. It mentioned Jim’s name, but not mine. That’s how it goes in the world of academia, I guess. About twelve years later thieves came in and cut the tracks out with concrete saws and no one knows where they ended up. I was very sad to hear about it because I always hoped someday someone would purchase the land and make it into a museum or attraction. The ironic thing is that the tracks weren’t really worth all that much monetarily, especially not when cut up and removed from the site. The value was scientific, in that they were complete trackways of several different species all alongside and crossing over each other. That’s where my interesting (some may disagree with that description!) dinosaur stories end. I have maintained my love for anything prehistoric, but I have moved on from just dinosaurs. In the years since I have become more fascinated by earlier life, the Paleozoic era with the Cambrian explosion and the abundance and variety of life that followed. I have a dream of one day going to the Burgess Shale, but who knows if I’ll ever get there. I have a fairly decent fossil collection, some of which are probably fakes, like the many that dominate the fossil market these days. You can find fossils being sold everywhere, on ebay, in fossil shops and flea markets, but there are so many fakes out there. There’s big money in fossils now, so the whole market is corrupt. If you see anything that comes from Morocco, chances are it’s not real and you should stay away from it. If someone is selling you any decent size fossil for $40.00 or so it is a scam. The fakes look very good these days; some experts even have trouble telling them apart from the real ones. I have a very small trilobite fossil that I had mounted on a silver necklace that I have worn every day for over 20 years now. I feel naked without it and it’s a geeky conversation starter, but I get a tiny thrill out of knowing that I’m wearing something left behind from an animal that lived 500 million years ago. Some times I feel a twinge of regret that I didn’t go to college, didn’t try my hardest to become a paleontologist like I wanted. I have more interest now in physics and astronomy than in my old friends the dinosaurs, but I still like to read what I can about them. One day a few years back, I was in the grocery store using the self checkout lane. As I scanned my groceries my necklace caught my eye and I suddenly realized something. My Book About Me, my childhood book I wrote about myself. Paleontologist or shopkeeper. Here now, checking out my own groceries with a fossil around my neck … how many of you can say you came that close to your childhood dream? I knew about the Aurora models and stuff, but I had no idea what depth of paleontology wonk you were. Now you've moved from the rocks to the stars and all the particles in between. Good on you.